Super Savings Item! Free Shipping Included! 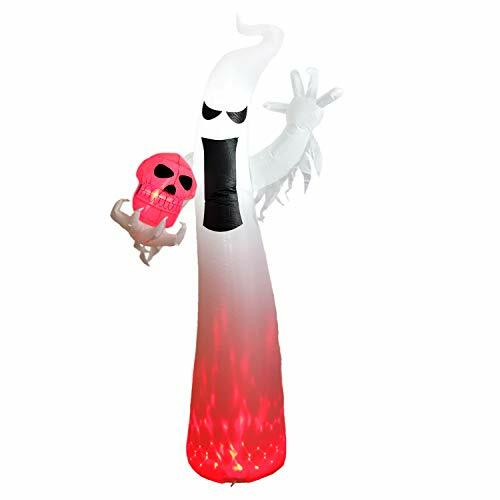 Save 34% on the Dreamone FLA Indoor Outdoor Yard Garden Party Decorations 9 Foot Halloween Inflatable Flashing Flame Ghost for Hallowee, White by Dreamone at List It Fort Lauderdale. MPN: Dreamone 9 Foot Halloween Inflatable Fla. Hurry! Limited time offer. Offer valid only while supplies last. Product Description For eerie indoor or awesome outdoor fun, this Halloween decoration is a great way to make your home or yard shine this October. For eerie indoor or awesome outdoor fun, this Halloween decoration is a great way to make your home or yard shine this October. A colorful, light-up way to make your holiday bright, it can even be used in the daytime to add a glow to the landscape. Frighten your guests with this amazing Halloween yard inflatables ghost. Plug it in, stake it down and watch the magic of this Airblown Inflatables unfold. Package Include: 1 x Inflatable ghost, 1 x Inflator ,2 x Sandbags ,7 x Stake ,3 x Ropes. Animated: cute ghost inflatable, great for yard, home, lawn, holiday decoration. Designed to be waterproof and can be used outdoors. This product is intended for Halloween decoration only, not to be used by children as a toy and not intended for household illumination. Unroll the giant inflatable in a clean, open area, free from obstruction or any debris. Do not place this product near other lights, fireplaces, gas or electric heaters, candles, radiators or any other sources of heat, fire or flammable liquids. 100% MONEY-BACK GUARANTEE OF SATISFACTION! From workmanship to function to anything else, we want you to be TOTALLY HAPPY - or else you can return the inflatable ghost and we'll REFUND your money! You take NO RISK by ordering today! If you have any questions about this product by Dreamone, contact us by completing and submitting the form below. If you are looking for a specif part number, please include it with your message.